Scientists tasked with looking for signs of alien life are the latest group to be affected by the current cryptocurrency mining craze, as they are struggling to get hold of high-end graphics cards to help with their search. At the moment GPUs are hard to buy, as people looking to mine for crytpocurrencies such as Bitcoin are buying up graphics cards in large quantities, and while companies such as Nvidia are trying to help make it easier for regular customers to buy their cards, when they actually are in stock the GPUs are usually ridiculously expensive. It appeared that the biggest impact was on gamers, who were struggling to upgrade their PCs, but in a report by the BBC, researchers from SETI (Search for Extraterrestrial Intelligence) have revealed that their plan to expand their operations are also being hampered. SETI’s work involves listening to as many frequency channels as possible in search of alien broadcasts, and this requires a lot of computing power, much of it supplied by graphics cards. 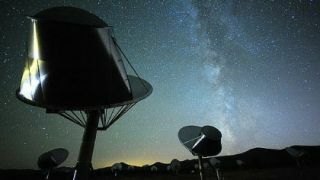 The SETI observatory in Berkeley has around 100 GPUs working on the search for extraterrestrials, and it was hoped they could expand the hardware at its observatories at Green Bank in West Virginia and Parkes in Australia. “We've got the money, we've contacted the vendors, and they say, 'We just don't have them'," said Dr Werthimer. As the BBC reports, other astronomers are also being affected, with scientists at the Hydrogen Epoch of Reionisation Array (Hera), which searches for evidence of the earliest stars in the universe, struggling to afford new GPUs since the prices have doubled. “It's going to end up costing about $32,000 extra," said Professor Aaron Parsons, who also revealed that future work could be in jeopardy if GPU prices continue to rise. So, while miners snapping up the best GPUs for cryptocurrency mining have made it hard for gamers to get the hardware to blast fictional aliens, it looks like they are also hampering our search for real little green men as well.